Two summers ago, when I had just started scraping and painting the exterior of our home, I put up cedar shingles in the back to match the ones the previous owner had put up in the front. That’s a really easy face lift job you can do yourself, by the way. 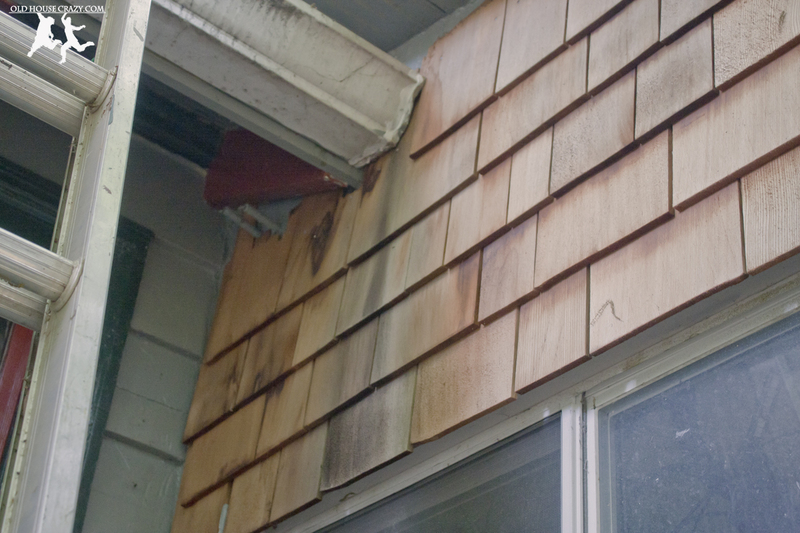 As you can see in the photo above, water has been leaking out of the gutter and has discolored the shingles. It has apparently been doing this for many years. I know because I had to do some pretty serious repair to the bottom of the window you can just see in the photo. 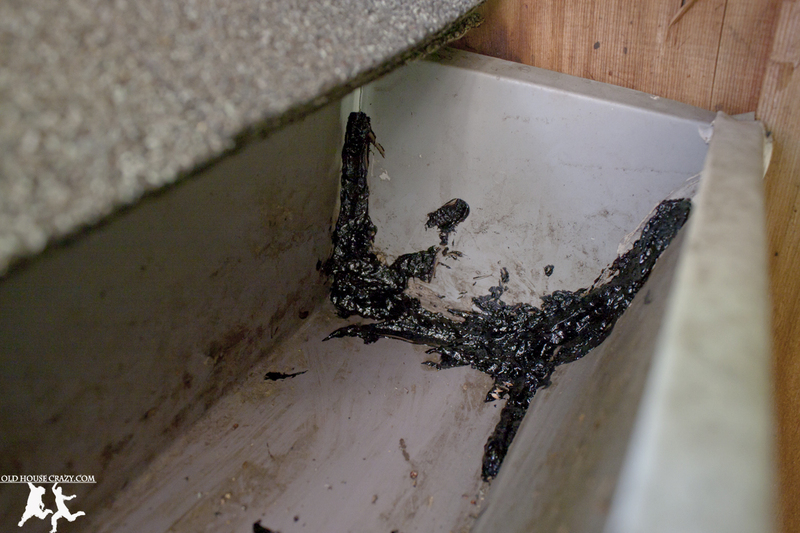 The bottom sill had been pretty well rotted. 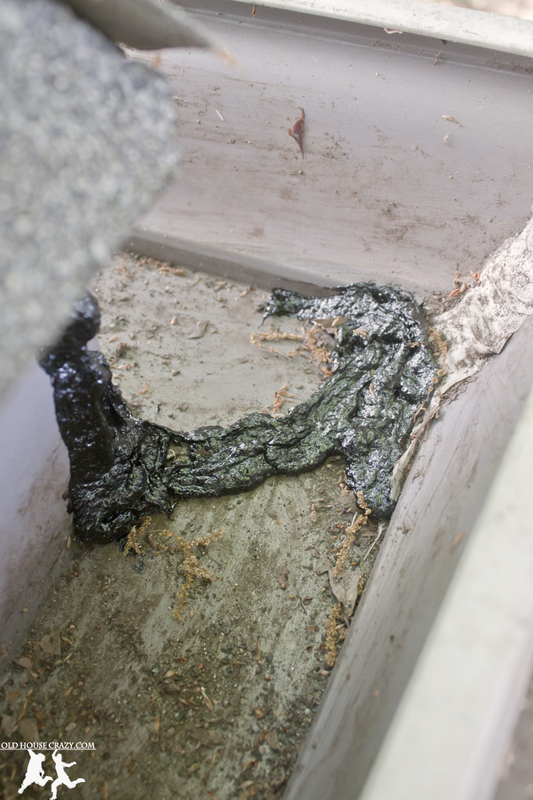 If you get up onto your ladder and look inside your gutters, you can see that the ends are caulked to seal the water in. 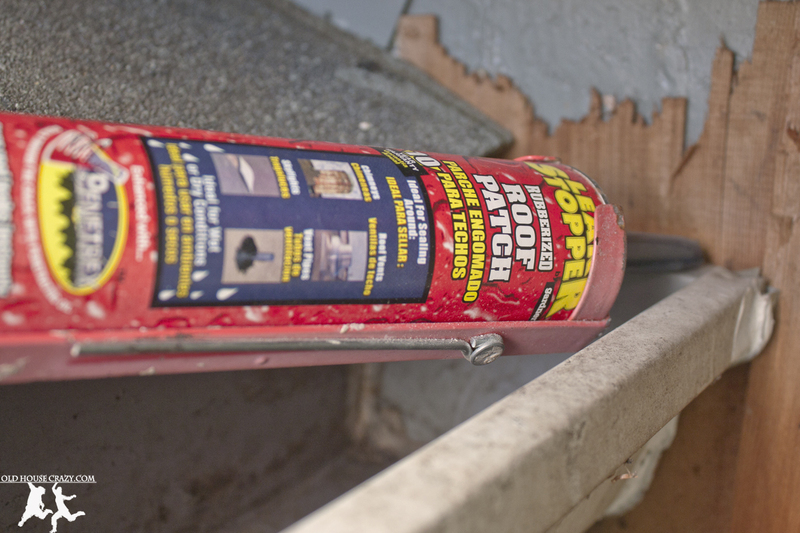 Over the years, this caulk can fail and water can seep out. That’s where my leak came from. Pick up some of the product you see below and you can properly seal those joints. It’s the nastiest stuff you can buy, somewhere between asphalt and glue, and it’s sold near the roofing shingles in Lowe’s or Home Depot. 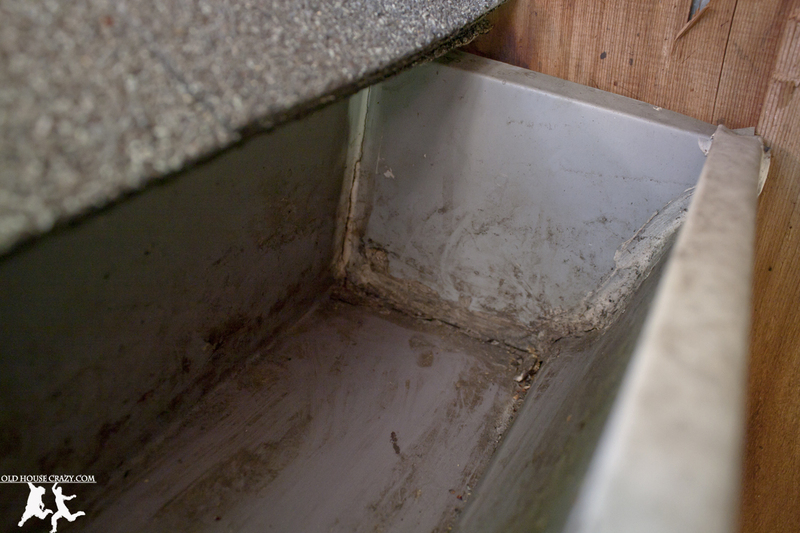 It’s used to seal the joints around roof vents, so it’s really good at keeping water out (or in). You’ll need a caulking gun, so buy one if you don’t have one already. Trust me, if you want to keep up this DIY thing, you’ll use it again. You can tell in the photos that I wasn’t all that worried about getting the surfaces totally clean. This product is so nasty that I figure it’ll stick to anything, even a little extra dirt and some pollen granules. Also, since it’s inside a gutter, nobody cares what it looks like, so get it all up in that joint. It lasts a long time and is completely water repellant. 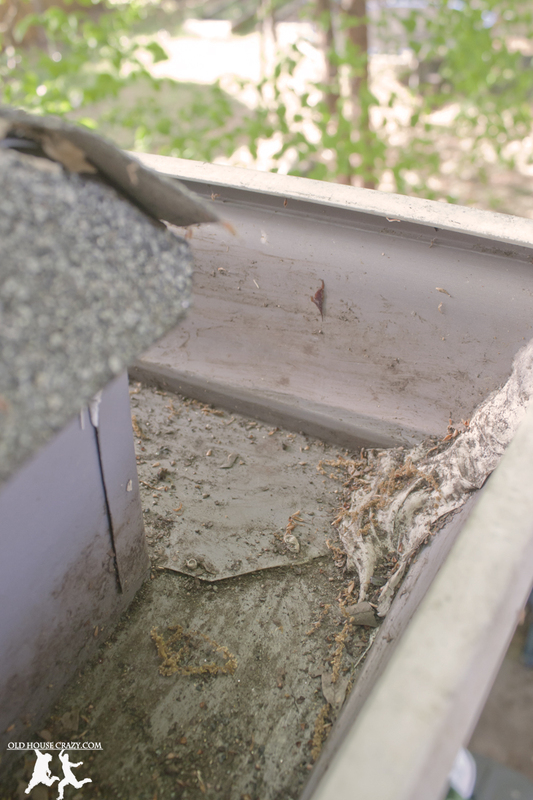 This entry was posted in DIY, Don't Hire a Professional, Exterior Maintenance, Gutters, House Repairs, Roof and tagged DIY, diy project, don't hire a professional, Gutters, house repairs. Bookmark the permalink.